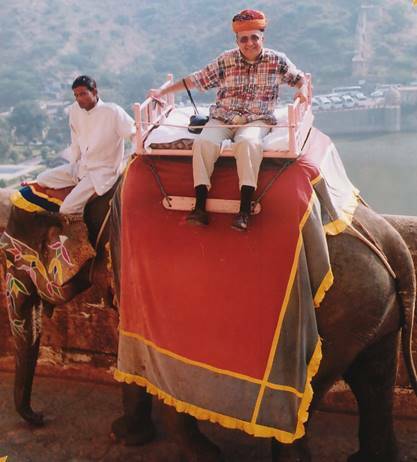 When I hopped my silver jet to India, it was only with one thought in mind: to ride the elephants. Riding elephants isn’t a new experience for me. Like most travelers with a spirit of adventure I have mounted a few in my time. Although they aren’t the cutest mammals, they have always delighted and fascinated me. One of my favorite travel stories is about an elephant. About five years ago, in the jungles of Northern Thailand, I was having a tête-a-tête with an elephant -- charming him with my sparkling wit and delicious bananas when another elephant approached me from the rear. At first I was confused by the involuntary liftoff of my arm. When I turned to confront the reason, I saw this very determined seven-foot high beast eyeballing me. There is nothing more intimidating than an elephant with an attitude. I knew then and there that it was either me or my bananas. Rather than provoke my new friend, I abandoned all fruit and escaped to freedom on the trunk of another elephant. For many of us, the image of elephants generates amusement, not fear. So when I arrived in Rajasthan, India, and checked into my palace, I was quite disappointed to discover that I wasn’t greeted by the local elephants as the travel books promised. Determined to correct this oversight, after devouring a 10-course Indian breakfast, I hailed the first elephant going my way – which turned out to be heading to a very popular fort in Jaipur. Before climbing aboard, my guide, a sensible man in his thirties, felt it necessary to tell me about an incident that had occurred at the Amber Fort not too long ago when a temperamental elephant decided to take out his unhappiness (by design or in panic) on a tourist. At the time, I thought this was strange information to share with me. In retrospect, I believe he needed to warn me, possibly to free himself of any emotional liability in case anything went wrong. I didn't listen. I had traveled thousands of miles to ride an elephant and no guide was going to dampen my enthusiasm. So without thinking about the consequences, I hopped aboard my elephant and instructed it to take me to my fort in the sky. No matter how hard you try, riding on the back of a nine-foot high elephant is not a comfortable or majestic experience and it is even less comfortable and majestic when your chair is facing to the left, You have no sense of stability, and you have nothing to secure you, except the sheer strength of your will. When the elephant walks, its body shakes like Jell-O and the chair rocks with it. Too high to jump off, you feel totally at the mercy of the moment, as this huge creature leisurely enjoys his morning stroll. Since the Indians like the English drive on the “wrong” side of the street, I traveled up a narrow winding hill, looking over the edge into a valley about a hundred feet or more below. For what appeared to be an inordinate amount of time, I clung to my chair, while the elephant shimmied up the road. Every time another elephant came down or a car raced up the hill, I felt a sense of impending doom. I swore then and there if I ever made it to the top, I would never travel by elephant again – anywhere! One nice thing about getting old – you forget easily. On my last day at the Rambagh Palace, where I was a guest, they brought out all the elephants (the Japanese had arrived that morning). Guess who was there waiting to ride an elephant, sitting properly under a canopied chair, facing the right direction, like a maharajah. Joe David is the author of numerous travel articles and six books, including The Fire Within, Gourmet Getaways, The Infidels, and Teacher of the Year.